Early in February I signed up to participate in a swap hosted by Leah at Our Yellow House. I’ve been off swaps for a few years now–mostly because most of them are really huge and focused on the stuff rather than on the connection. But this one appealed to me because it’s a one-to-one swap (so you’re matched with one other person), and because participants aren’t allowed to spend any money. Yup, that’s right: you need to work with what you have, and send four things that meet certain descriptions. I was matched with Melinda, who is unfortunately blogless. We’ve been writing back and forth, and I’ve really enjoyed getting to know her. What an interesting person! Maybe one day if she starts a blog you’ll get to discover her wonderfulness for yourself; until then, you’ll just have to take my word for it. Her package for me arrived last week. We didn’t even have to mail stuff until the end of the month, so its early arrival was a pleasant surprise. Everything in here was handmade by Melinda. The little book (she knows about bookbinding–how cool is that?) has several pages with pockets at the beginning. I think this may become my new knitting notebook! At the bottom right is a sewn coffee-cup cozy that I know will come in handy. And at the bottom right? This is what it looks like opened up. 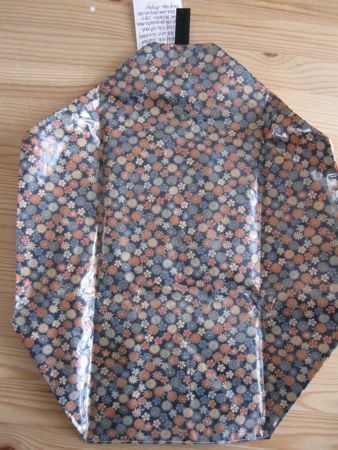 It’s a reusable sandwich wrap! I have been wanting one of these since I first started seeing them online a few years ago. My usual MO is to wash out and reuse ziploc bags until they fall apart, but I like this option much better. Thanks, Melinda! My package to you went out in yesterday’s mail–I hope you like it! 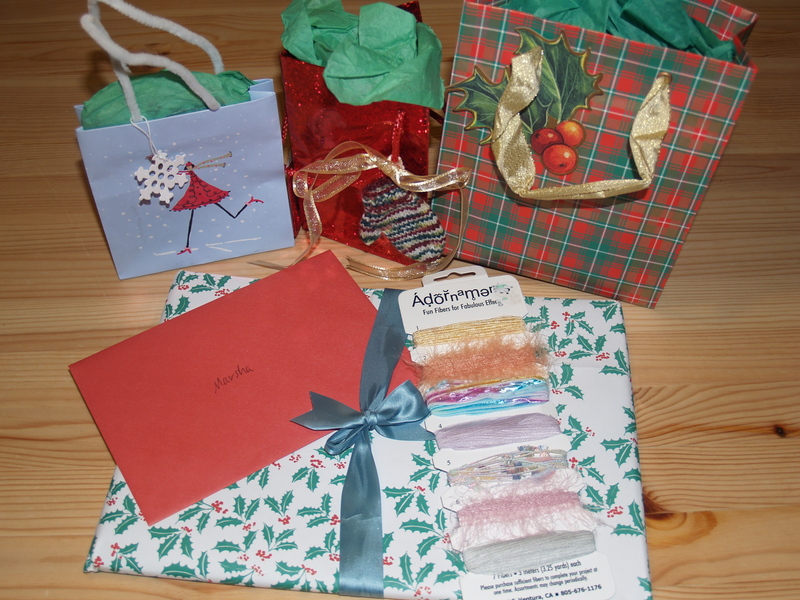 I’ve participated in a number of knitting-related swaps in the past. They’ve exposed me to people and blogs I otherwise probably would have missed. I’m happy to be in touch still with nearly all of my swap partners. We keep up with each others’ blogs and swap e-mail from time to time. And I’m very glad about that, because I do these swaps in order to connect with people—I think that people who are in it just for the loot should save themselves and everyone else a lot of trouble and just buy what they want for themselves. One of the biggest swaps out there is the Secret Pal series. It’s huge—to the tune of several hundred people, scattered around the world and organized by eight or ten or so volunteers. I first signed up to SP8, in the spring of 2006, and kept signing up through SP11. For the most part, my experiences with these swaps were great. I met some interesting and kind people, and I’m delighted to count them among my friends. Last fall, as SP11 wound to a close, there was a big blowup on Ravelry about it. In short: the SP exchange rules specifically state that participants can not “bad mouth” their partners, the hosts, or the swap on their blogs. Some participants had less-than-happy experiences with SP11 (e.g., swap partners who didn’t fulfill expectation, swap partners who completely disappeared, hosts who did not respond to queries or concerns). Since they weren’t allowed to write about these things on their own blogs, they took the discussion to the Ravelry forums. And there, things got nasty. They got so nasty, in fact, that the SP hosts decided to take a break from hosting the swap. Usually one round follows another, with just a few weeks between the end of one and signups for the next. But this time the break lasted several months. When SP12 was announced in May, I took at a look at the blog set up for it. When I read the rules, I knew then and there that I wasn’t going to participate. 1. I understand that partners do sometimes flake out and disappear. But I don’t like the idea of requiring participants to contribute to a fund to pay for gifts in those situations. Asking for up-front contributions assumes that people will be bad swap partners. Me, I like to have a bit more faith in people. The whole swap experience is predicated on trust: when I send a box o’ goodies to someone, I trust that someone will send a box o’ goodies to me. This sort of thing confirms my belief that people are essentially good. I don’t want to participate in something that starts with the belief that some people will definitely be bad. 2. I’m not keen on the fact that individual participants don’t get to choose where the excess funds go. Me, I’m very choosy about where my charitable donations go. What if the swap hosts decide to donate the money to, say, the NRA? Or to a white supremacist group? Or to McCain’s election fund? Or to another cause that isn’t aligned with my own values? It’s bad enough that my taxes (about which I have no choice) are helping fund American military aggression overseas; I’m unwilling to let money that I voluntarily contribute go to causes I don’t support. 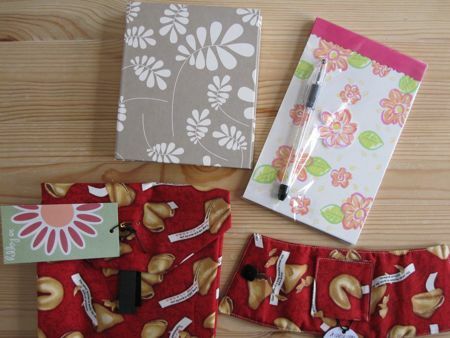 Tea–four bags in a handmade tea wallet (Paula, did you sew this yourself? ), and a tin of Adagio’s candy cane tea (which is just right for the season!). Two row counters–a small round one to pop onto my needle, and a Kach-Kacha. Talk about a coincidence: just the night before, I was thinking about the Kach-Kacha that had mysteriously disappeared once a certain two-year-old got her hands on it, and I was wondering if I should get another one. Good timing, Paula! A tin of green tea mints (I love these things), a copy of Kim Hargreaves’ Pipsqueaks , and a cute cart rounded out the package. I’ve had my eye on this book for a while (the first Rowan book in my library!) and am really looking forward to knitting up some of the patterns in it! Thanks, Paula, for sending such wonderful treats and being a terrific SP11 partner! I’ve been very fortunate to have some terrific upstream swap partners, and now I have another name to add to that list. 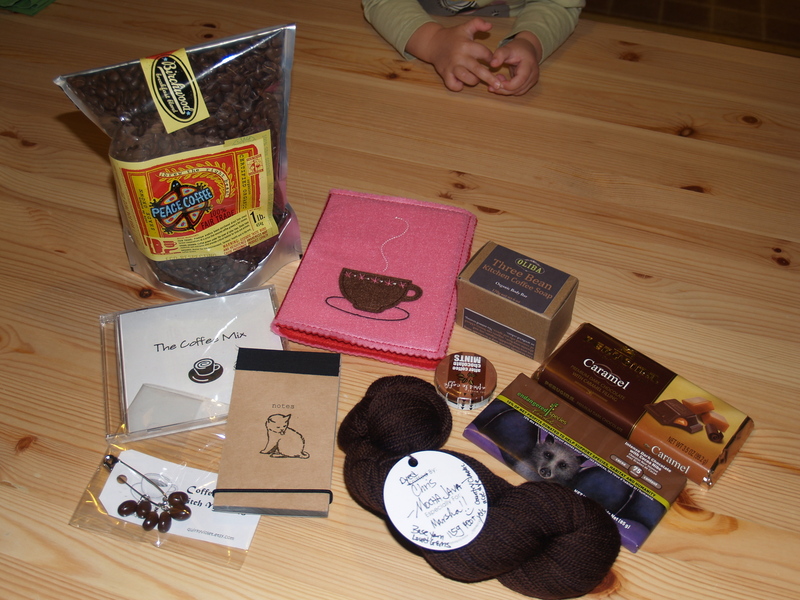 Chris is my partner for the Knitters’ Coffee Swap (not upstream but sort of sideways–we know each other’s identity from the beginning and send each other a package), and her package for me arrived in yesterday’s mail. There’s coffee, of course (fair trade! shade grown! organic! )–Peace Coffee from a Minneapolis roaster. I haven’t even tried it yet and I already love it. To go with the coffee are two bars of chocolate and after-coffee chocolate mints. A notepad (which Chris stamped with a cat image) and a photo album with a coffee cup on it will help me keep track of notes and photos, and a bar of Oliba’s Three Bean Kitchen Coffee Soap (which, contrary to its name, is going in my shower) will ensure that I start the day smelling nice. There’s a mix CD of twenty-seven songs that all have the word “coffee” in their titles–great listening for when I’m knitting up some socks in the fabulous “Mocha Java” sock yarn that Chris dyed just for me and using the coffee-bean stitch markers (how cool is that?) to mark my place. Oh, and those little hands at the top of the picture? Those belong to Sylvia, who was very excited to “help Mommy open her present” and could hardly wait to get her hands on the photo album. Another terrific package from my upstream SP11 pal landed on my doorstep this afternoon. The presentation was so nice (garden-motif wrapping paper and a Halloween-themed box and ribbons) that I was almost reluctant to unpack everything! 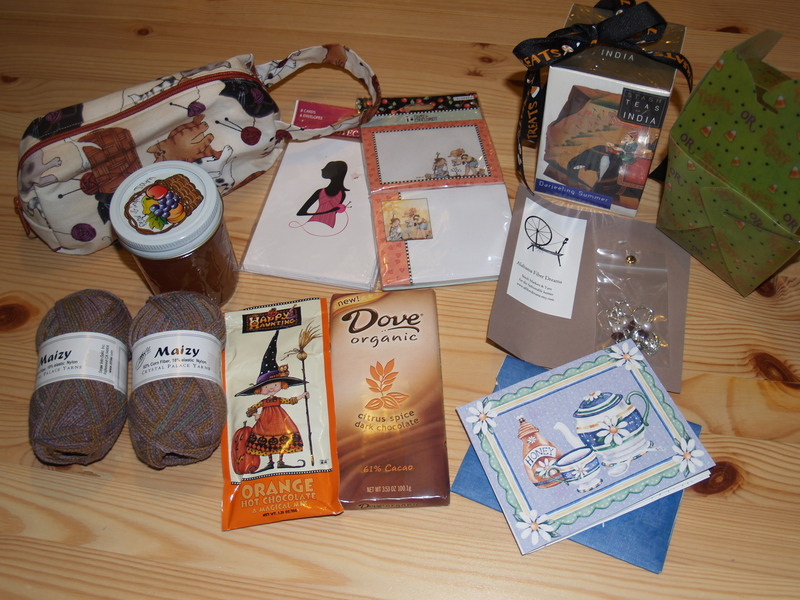 The box also contained more tea, chocolate, notecards, and sticky notes. And a jar of pear-ginger jam. That she made herself. I can’t wait to try it on some scones alongside a pot of tea. She also sent two skeins of Crystal Palace Maizy, a new sock yarn that’s made of 82% corn fiber and 18% elastic, as well as a trio of stitch markers with little teapots on them. Teapots, people! The cuteness is overwhelming! Last but not least, she sent a project bag that she made of fabric with pictures of cats, yarn, and knitting needles on it. In her note, she wrote, “When I saw you were learning to sew*, I figured you would not be critical of my sewing.” “Not be critical” is an understatement–this little bag is amazing. I adore it and can’t wait to put it to good use–perhaps for whatever socks I’m knitting at the moment. It’s the perfect size for them! Thanks for another great package, SP11! Everything you sent it just perfect for me! One thing I love about knitting is how it’s introduced me to the social circle known as the local knitting group. Mine consists of about a dozen women, and at one of our meetings there are usually anywhere from four to eight of us present (though we’ve had larger gatherings–and even gatherings of just two people). For years (long before I joined it) the group has met monthly at a local community center, and last fall we added a monthly meeting at Starbuck’s to the mix. Some time during the winter, a few of us found ourselves wanting to get together more often, so we started having spur-of-the-moment meetings on “off weeks” (when we weren’t at either of our regularly scheduled locations) at Barnes and Noble (which not only has coffee and snacks, but also stays open quite late–and we do close down the place!). This group consists of some relatively new knitters (like me) and some very experienced knitters (pretty much everyone else). Everyone is so generous with knitting advice and knowledge! I created a private Google Group for us about a year ago, and it seems that every day someone is asking questions, answering questions, sharing interesting links, pointing out fun patterns, and engaging in fun banter and chitchat. I love it. Last Thursday, we held a yarn swap/sale among ourselves, at our scheduled meeting at the community center, which is the only place with tables where we could spread out the swag. And wow, we really needed those tables: people cleaned out their stashes and brought boxes and boxes of stuff to swap and sell. My own stash is fairly meager, so I brought only some sock yarn in a lovely-but-definitely-not-for-me color (which I swapped for something else). But I went home with a tote bag full of stuff that other people no longer wanted–but for which I already have ideas. What fun! In early summer, I signed up for the Knitting Gnome Swap. 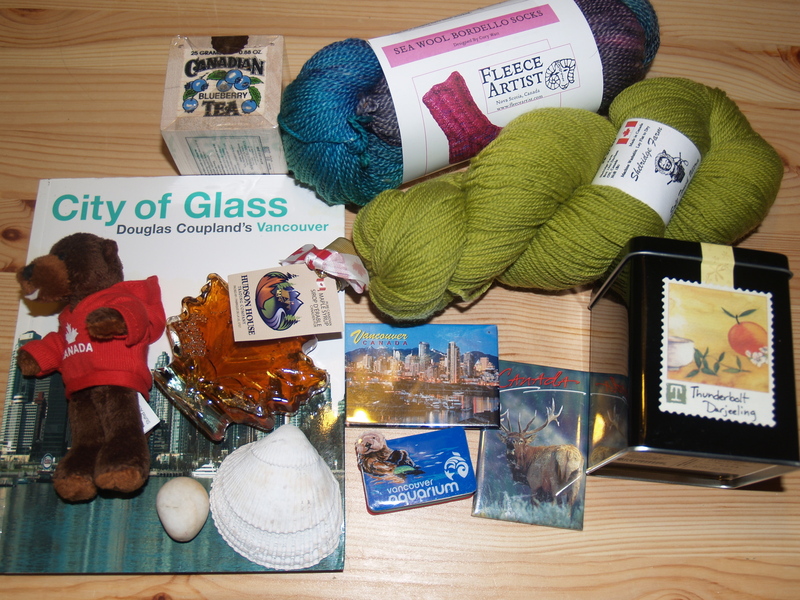 It’s a linear swap: you get a box with a knitted gnome and some knitting-related stuff in it, and you keep the stuff and send the gnome (along with knitting-related stuff that you’ve gathered for your pal) to the person downstream from you. Gnorm the gnome (and his brother, Gnuman–there are two traveling gnomes for this swap) has been on the road since May and, after a month-and-a-half delay in New Jersey, finally made it to my house last weekend. My knitting group was excited to meet him, so I brought him to last night’s get-together and took lots of photos. Yesterday’s mail brought a box of treats for me, straight from my upstream SP11: a skein of Fearless Fibers sock yarn in a fabulous mauve/gray/dusky-blue colorway (love it! ), a set of size US1.5 needles (which, to be honest, I didn’t even know existed! 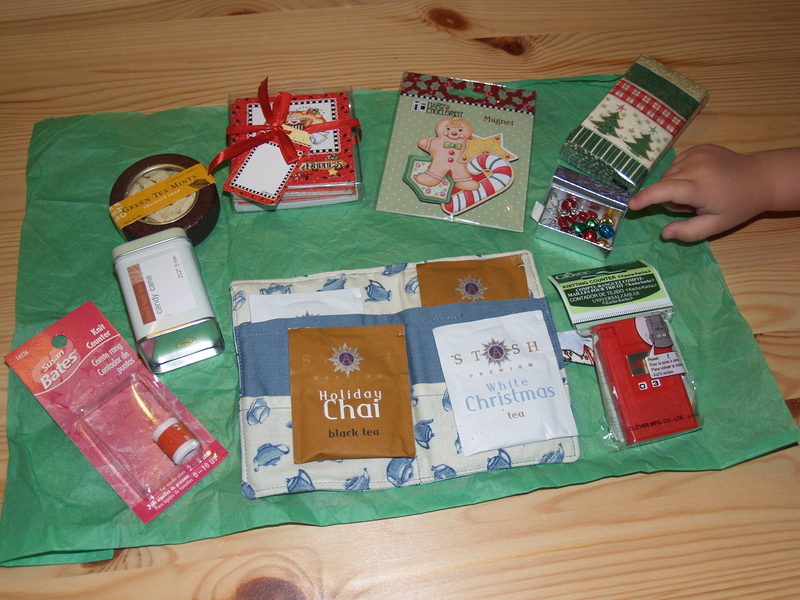 ), a stitch holder (not seen here because it’s in the same package as the needles), a card with a very clever pocket for a tea bag (in this case, chai spice black tea–yum! 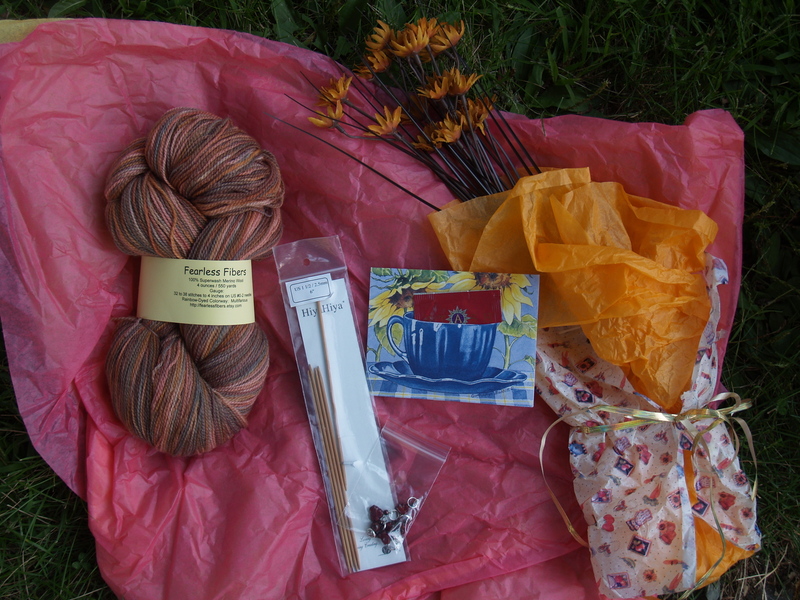 ), a set of leaf-shaped stitch markers, and a bouquet of flowers to round off the autumnal feel to this package. I’m so grateful for everything–what a wonderful set of gifts! And just right for me, too. Thanks so much, SP11! 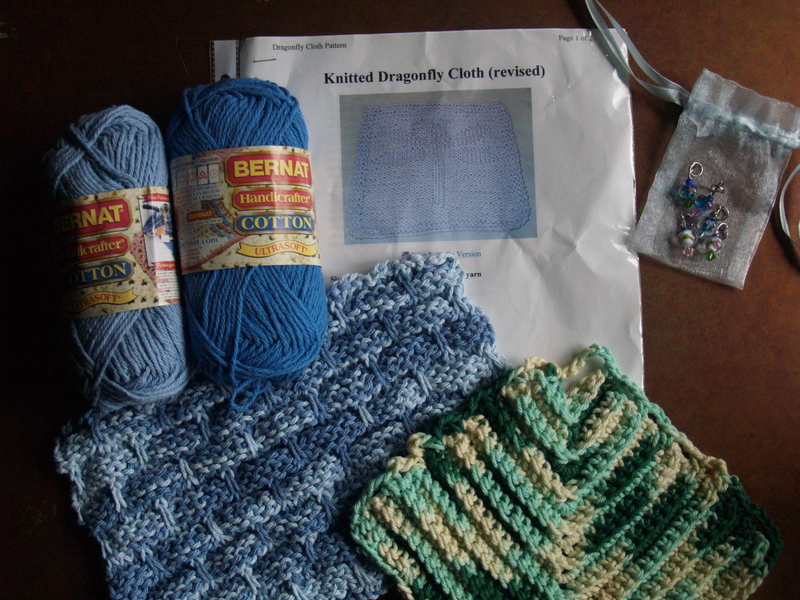 Early in the summer, I signed up for the Knitter’s Virtual Vacation Swap. Over the summer, participants chatted with their matches, then sent a “virtual vacation” package from where they live to their downstream partner. I’ve had some lovely e-mail chats with my upstream partner but had no idea who she was until yesterday, when her package arrived: Chelle, at Rainforest Knits, in Burnaby, Canada. Burnaby is in the suburbs of Vancouver, where Chelle grew up, and she sent me a fabulous collection of items from Vancouver and elsewhere in Canada. Tea. Thunderbolt Darjeeling (which I’ve not tried before, though Darjeeling is my favorite variety of tea) and blueberry tea (which I am looking forward to trying!). Magnets. I collect fridge magnets, and Chelle sent three of them (including one with an otter, Gina!). Maple syrup. In a maple leaf–shaped bottle! A tiny stuffed beaver wearing a red sweater with “Canada” on it. City of Glass , Douglas Coupland’s ode to Vancouver. A rock and seashell (collected and cleaned by Chelle’s daughter) from a rocky beach on Galiano Island. Everything in this package is so lovely. I feel like I’ve taken a trip to Vancouver. Actually, I have been to Vancouver—during one spring break while I was in grad school—and I loved it. I’m not a big-city person, but Vancouver struck me as a place I’d like to live. For now, I’ll have to content myself with traveling there virtually, thanks to Chelle—and maybe starting to hatch plans to travel there for real some time in the not-too-distant future. The syrup and sock yarn were interesting to see, because my husband and I use similarly shaped bottles of maple syrup (my hunch is there’s one company in the world that makes those things and sells them to all the sugar houses) as wedding favors when we got married in Vermont. And the yarn has a wedding connection, too: it’s from Nova Scotia, one of the places we visited on our honeymoon. There’s still no sign of Gnorm from the Knitting Gnome Swap. I’m glad I didn’t miss his arrival while I was gone, but I hope he hasn’t lost his way here. When my mail carrier delivered two weeks’ worth of mail to me this afternoon, I was delighted to discover a package from my Dishcloth Swap pal, who sent it all the way from Canada. (I should point out that the arrival of two weeks’ worth of mail in one fell swoop is cause of excitement on its own. I love to get mail, and one thing I like about going on vacation is the deluge of mail when I get home.) Barb sent me a terrific set of treats! On the yarn-related front, there were not one but two dishcloths–a blue one in the ball-band stripe pattern, and a green mitered square with a handy hanging loop at one end. She sent two skeins of skein cotton yarn, which I will probably use to make a dragonfly dishcloth, for which she provided the pattern. Five beaded stitch markers (did you make those yourself, Barb?) will help me keep my place. Barb also sent a bar of cow-milk soap (not tested on animals–hooray!) 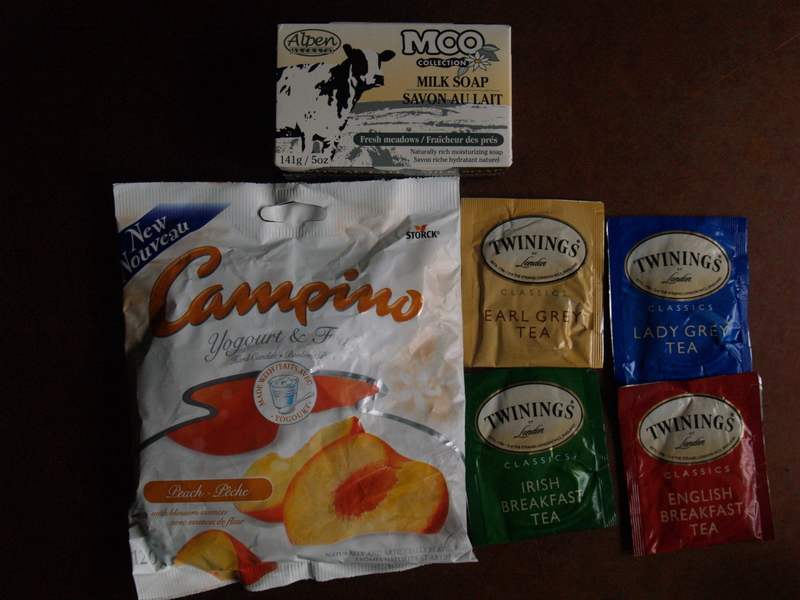 and a lovely assortment of tea. When I read the label on the bag of yogurt-peach candies, I was astonished to discover that they are 22% yogurt. Who knew candy could be so healthy? Thanks, Barb, for being a great Dishcloth Swap partner!